War on the Eastern Front engulfed small Axis satellites like a hungry wolf. None were spared. Hungarians, Romanians, Yugoslavs and Finns clashed with the Soviet giant and Nazi supermen, as well as one another in a senseless yet hellish struggle. Tanks of all marks, and outdated weaponry met the first futuristic MBTs as the miles and weeks ticked away until Gotterdämmerung in Berlin and the end of what was unleased with Barbarossa. 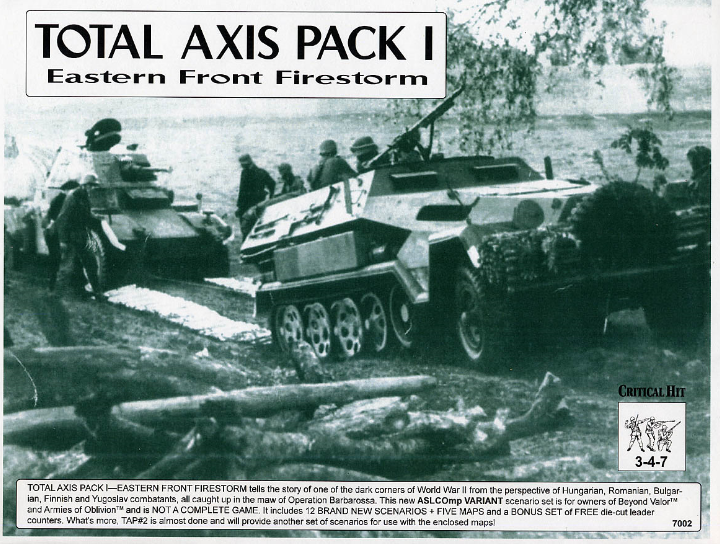 Maps are what CH is all about and TOTAL AXIS PACK I—EASTERN FRONT FIRESTORM provides More maps than any ASL Comp or official product ever. A collection of SIX maps, ranging in size from 24” x 36” to smaller sizes, are provided for use with the entire TOTAL AXIS PACK SERIES of scenarios. This is not a complete game! Ownership of Beyond Valor and Armies of the Oblivion are required to use this product. Ownership of CH’s Jatkosota: Finland at War is also suggested. The 1st printing of this game originally came with 50 "bonus" counters while supplies last (not required for use). These counters are no longer included unless noted in the condition description. • A 4-color cover sheet perfect for your rules binder!